I know I've spent December grumbling about stupid hats. . . but I'm a pretty happy, lucky, happy-go-lucky guy. 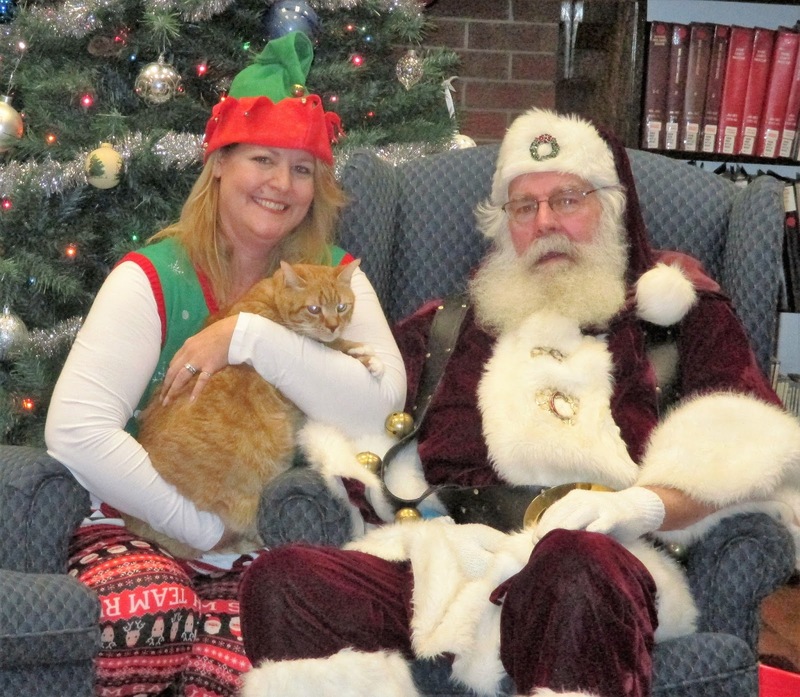 Being a Library Cat is great (so far), and I've gotten lots of extra treats and cuddles during the holiday season. Then my friend Anita brought in a card just for me too! I asked for treats. And no more hats. Merry Christmas, friends! I hope all of your Christmas wishes come true. I thought I was done with hats after the "Who Wore It Best?" fiasco. But, no. During a flurry of last-minute, thank-goodness-for-Amazon shopping, *somebody* noticed that a certain hat/beard combo was back in stock. A beard, as if I don't have my own nice chin-hairs! Look how sad I am! After my other ear was "tucked in" I did this. . .
. . . and photographer finally felt sorry and took it off. Whew. But! Poor Ollie. He can't even defend himself. Of course, he has a perpetual frown/grumpus face. If you recall, following the Halloween hat debacle I was threatened with the notion of wearing a Santa hat (and beard). Thank goodness the beard-Santa hat combo was out-of-stock on Amazon is all I can say. That didn't stop my photographer from going to a Petsmart store and choosing a Santa hat for me to wear. I hate it. It bothers my ears! But I did wear it, for only a minute--and so did lots of other critters in my library. So who do you think wore it best? That is one mean, bitey clownfish! Our first attempt at a Bookmas Tree! Was napping, and then. . . HAT! One of the beloved Youth Department Singin' Critters! There's some weird stuff around here. Sometimes, when no one's looking, I bat Hedgie around the library. Mr. Fox usually lives in The Secret Garden. Not even wearing the hat. DISQUALIFIED! Sad Panda is sad. He doesn't like wearing the hat, either. Consulting the map to get away from this hat. All of the other Waters are jealous. . . or relieved. Who knows? SO. . . who wore it best?!? PS - Monday is our family Christmas night at the library! If you are a Boone Countian, or within driving distance, I've heard our Christmas par-tay is worth a visit! (I will be safely locked away in my office!) Stop by from 6-8 pm on Monday December 5 for cookies, crafts, photos with Santa, a live animal show by Silly Safaris, strolling magic by Marc Lehmann, and a free book for each child! We all have a lot to be thankful for, don't we? Lots of food, love, warm blankies, awesome toys, catnip, sunbeams, comfy chairs, and, most of all, Forever Homes.
. . . zzzZZZzzzzzzz. . . Okay, I got all of that sappy stuff out of the way. At least there were treats involved. You know she's desperate when she uses treat for bribes! I'm not a turkey, lady. My library is closed today, but I will have visits from my best friend Karen. I am thankful that she doesn't count treats but instead dumps them from the bag into a little (or big) pile. Today it has been one whole year since my esteemed predecessor Tober the World and Internet-Famous Library Cat crossed over the Bridge. My coworkers have files full of mementos from his years of Librarycatdomhood. Christmas cards, signs, old collars (that he absolutely refused to wear, even if they were hand-made or special-ordered and had the Dewey number for "cat" on them), letters and artwork from fans and friends. One of the mementos you see in the photo above is the orange-and-green Forever Pepper that was crafted for Tober to help him with the loss of his real Pepper that he loved so much. You can read about his Pepper here and here. Well, the real Pepper's story didn't actually end in OcTOBER 2010. See, then-AAB Christine did (reluctantly) throw it away after she decided it was too yucky to be used as a Feline Training Device. So she tossed it in the wastebasket under her desk. As you know, in addition to being handsome, intelligent, and mancatly, Tober was a World-Class Wastebasket Tipper. Tober, caught in the act! Seriously. Picking up wastebaskets each morning should have been added to the custodian's job description. AAB Photographer was all the time getting shots of Tober's 'tocks sticking out of a wastebasket! Lookin' good for a 5-month-old! And she did with it what any rational (cat) person would do. She stuck it in her desk drawer. I'll spare you the details of how it moved from drawer to drawer, and eventually into another office, where it found its way to the bookcase where Tober's Forever Pepper now resides. Real Pepper has been there for a year, tucked away behind Forever Pepper, an homage to Tober's War on Produce and love of wastebasket-tipping. Sometime last month it would have celebrated its 6th birthday, if Peppers were celebrated like that. So, today, in memory and celebration of Tober, Library Cat Extraordinaire, I spent a few minutes admiring his Pepper. It smelled kind of weird. I tried to bite it, but it has been returned to its (hidden) place of honor. Remember Tober today by following the linkies in this post. 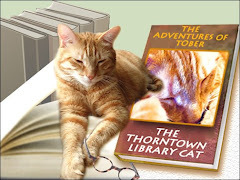 He had lots of fun being Library Cat, and lots of love, and he made lots of memories with his friends. Wherever the Bridge is, I hope it has a good supply of wastebaskets, Post-It notes, and Temptations cat treats. Now, I am a very patient, good, and tolerant cat. Karen and Christine marvel at what a good sport I am when it comes time to give me yucky medicines and stinky flea goop. I am really really good! Sometimes I don't even bother waking up all the way. I look fabulous. Be-witching, even! Oh, now I have an audience. Later this evening the Ladybug and some other weirdos library staff are going to be passing out candy at the library and the museum for hundreds of trick-or-treaters. I will be snoozing in my office, away from all the scary stuff. You all know the usual excuses, I'm sure. September has lots of stuff going on at my library, including Festival of the Floaty Book Sale and Carpet Cleaning, so the staff around here get bad at picture-taking and blog-helping. I also have a new super-special cubby that I can snooze in when I need a break from my Library Cat Duties. It is conveniently located on Britta's desk, and there's a photo of a(nother) Famous Library Cat right behind my sleeping-spot. Of course, sometimes the best napping spot is wherever you happen to be when you get sleepy. I'm going to tell you a sad (but not too sad) story. 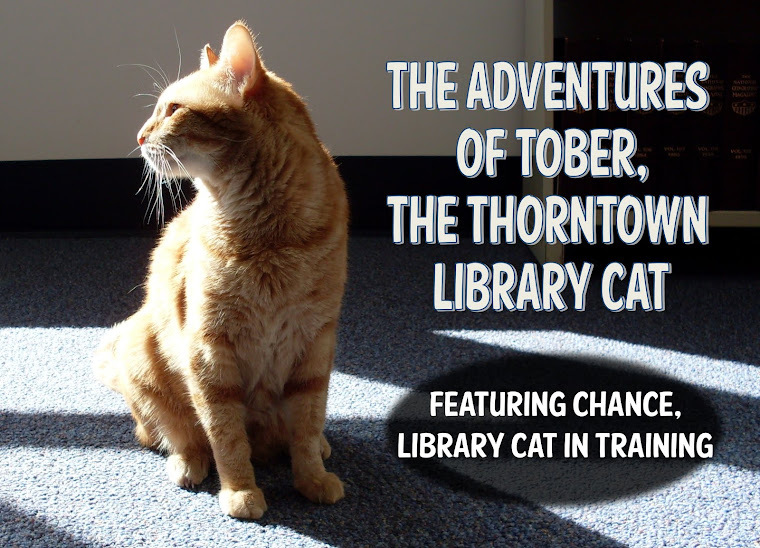 I'm sure you remember how Tober had all sorts of problems with the staff here at the library. As nice as they are, they have moments when they're weird (Hoodie-Hoo Day), rude (annoying photos), messy (Book Sale Carpet Cleaning Mess Week), and just plain irresponsible. Unfortunately I've experienced the irresponsible. A few weeks ago Christine and Kathy were here early on Saturday, like they were supposed to be. I greeted them and let them pet my belly and made them feel welcome and happy to be here. 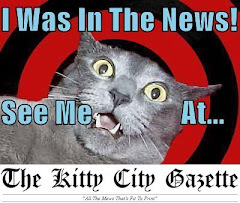 I visited Kathy at The Downstairs and meowed and acted nice. She petted me, gave me a few treats, went back to her work. So I went Upstairs and said HI (loudly) to Christine. She petted me, told me I was a good cat. I ran to my office and waited. I popped my head out, meowed (loudly). Christine said "Silly, I can't work in there. I have to be at the desk." In a desperate moment, I considered eating this corn-leaf thing. Like I said, this happened a few weeks ago. Last Tuesday one of my friends named Janet mentioned to Christine that she was surprised I hadn't told anybody about this awful oversight. Christine was like, "oooh, yeah, haha" (probably embarrassed) because you know Tober would have fired everybody (well, Kathy and Christine) pronto! Christine obviously felt bad about it, because later that night she confessed to Karen about the terrible Saturday morning oversight. Karen and Christine were busy gabbing away about how awful it is to forget to feed a cat. . .
. . . and I waited. 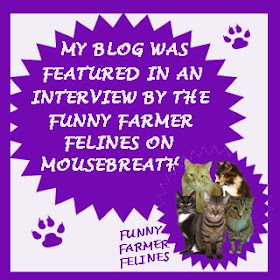 I meowed (loudly) and ran into my office. You guys, I did not have dinner until 7:30 that night! Dinner is usually served at 4:00 around these parts. Sheesh. Still they call me chubby, chunky, stout, and, yes, healthy. The good part of all of this is that Karen expresses her guilt by giving me more treats. Christine = no guilt whatsoever. She actually said "Well he could miss a few meals. . ." For shame. This week I had catnip, *fresh* catnip, for the first time. Oh. My. Gosh. Why didn't anyone tell me? 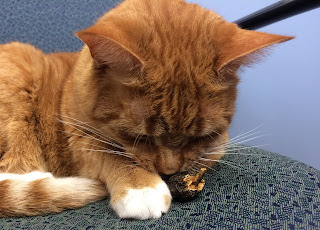 I have a 'nip 'nanner, and I get a daily dose of the dried-up crunchy catnip (not complaining! ), but this fresh-off-the-plant stuff is out of this world! Part of being a Library Cat is maintaining a dignified demeanor at all times. I have to represent Libraries AND Cats well. Thank goodness I learned about that before the fresh catnip arrived. I'd hate to appear silly. It smells so good! I wonder how it tastes. You should give. . . me. . . more of it! I love you, Fresh Catnip. So now I know I love fresh catnip! I hope more shows up here soon.